This 16 inch pad driver holds 17 inch pads. 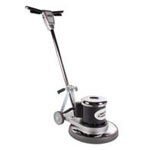 It is specifically made for the Viper Venom VN1715 floor buffer. This driver DOES come with the machine when you initially purchase it, but when it comes time to replace it, you can just order it from here. If you have another brand of machine then please feel free to check out our other pad holders and drivers.